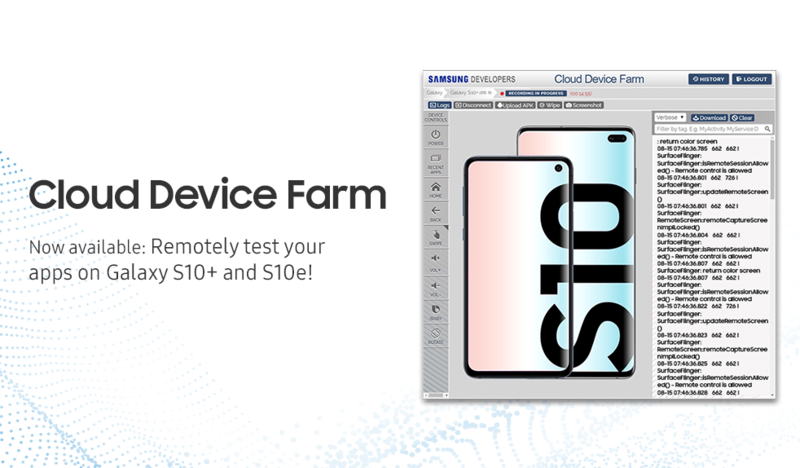 The Cloud Device Farm (CDF) allows you to remotely access an actual Samsung mobile device over the Internet. CDF devices use U.S. mobile service providers. You can install and test your applications in real time. CDF is a cost-effective and easy way to test you app compatibility with a Samsung mobile device. Not a member? Sign up – it’s free! Reserve an actual Samsung mobile device. Install, launch, and test applications on the device. Monitor and download debug log information. Watch automatically recorded videos of your sessions. Step #1. Go to Cloud Device Farm page in your Dashboard. Step #2. Go to the Cloud Device Farm page and click START TESTING. Internet Explorer and Microsoft Edge browsers are not supported. Testing of Theme APKs is not yet supported. Attention Fortnite Players: Fortnite cannot be installed or played on any Cloud Device Farm or Remote Galaxy Store devices. Any attempt will result in an unsuccessful install. To test your app on non-US devices, Gear or Family Hub, visit our Remote Test Lab. To test your app for China, visit our Remote Test Lab for China.